1. Cut flank steak lengthwise into strips 1 ½ inches wide; then cut across the grain into 1/8 -inch slices. Transfer steak to a mixing bowl. Add marinade ingredients and toss to coat thoroughly. Let stand for 15 minutes or longer in the refrigerator. 2. Rinse and cut green onions into 2- inch pieces. 3. Mix seasoning sauce ingredients in a small bowl. 1. Heat 1 tablespoon oil in a wok over high heat, add green onions and ¼ teaspoon salt. Stir-fry for 1 minute. Remove. 2. Rinse and dry wok. Heat 2 tablespoons oil over high heat. When hot, add dried chili peppers, then garlic, ginger, and beef. 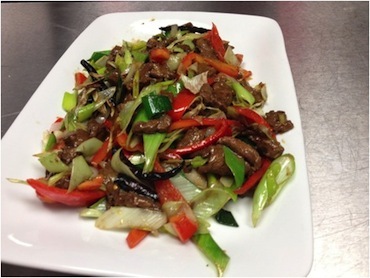 Stir-fry for 1 to 2 minutes until beef is almost cooked. 3. Return green onions to the wok. Pour in seasoning sauce. Stir quickly to mix. Remove and serve.